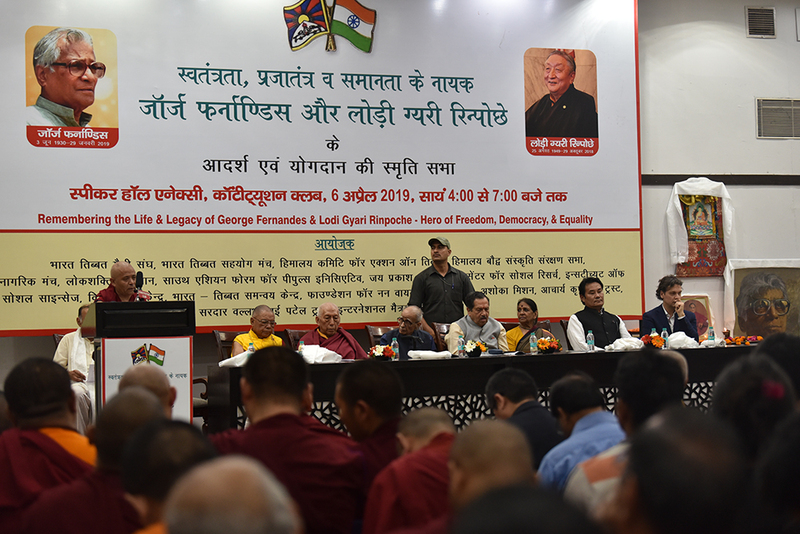 New Delhi: A memorial program “Remembering the Life & Legacy of George Fernandes and Lodi Gyari Rinpoche – Hero of Freedom, Democracy & Equality” was held at Speaker Hall Annexe, Constitution Club, New Delhi in the evening of 6 April. The program was graced by host of dignitaries namely Honourable T. N. Chaturvedi, Former Governor of Karnataka, His Eminence Prof. Samdhong Rinpoche, Former Kalon Tripa, CTA, Choekyong Wangchuk, Health Kalon, CTA, Acharya Yeshi Phuntsok, Deputy Speaker, TPiE, Shri Indresh Kumar, RSS Pracharak, Mr. Matteo Mecacci, ICT President, Smt. Jaya Jaitley, Indian politician, Lama Lobsang Yeshi of Ashoka Mission and others. Dr Anand Kumar, the master of ceremony gave the introductory remarks regarding the program. He called upon the dignitaries to share their views and pay tributes to George Fernandes and Gyari Lodi Rinpoche respectively. Honourable T.N. Chaturvedi, the chief guest during the event in his address said “George Fernandes and Gyari Lodi Rinpoche were champions of people. They had lived by one mission – humanity, democracy and freedom cause.” He said that he had known Gyari Rinpoche as knowledge person, good diplomat and expert in dealing with people. Remembering George Fernandes, he mentioned that George saab was a leader of people. Mr Chaturvedi paid his regards to the great souls and asked their friends and supporters to abide by their good deeds and keep their legacy alive. 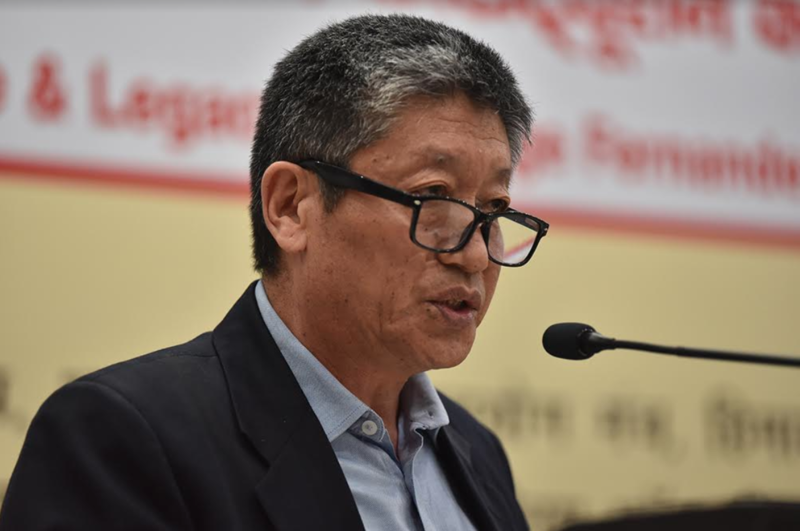 Kalon Choekyong Wangchuk, Department of Health, CTA speaking on behalf of Kashag at the memorial event “Remembering the life & legacy of George Fernandes and Lodi Gyari Rinpoche – Hero of Freedom, Democracy & Equality”. His Eminence said “Gyari Rinpoche was my colleague. Tibet has benefitted a lot from him. It is difficult to find a person like Gyari Rinpoche. He was the best choice for His Holiness the Dalai Lama’s special envoy. He did his best during the nine-round dialogues. There came hopes as well as setbacks.” Getting emotional, His Eminence said that he never thought Gyari Rinpoche would leave early. It was a great loss for Tibet. His Eminence, at last, paid his homage to both the great souls and thanked the organizers for giving him the opportunity to share his words. Kalon Choekyong Wangchuk on behalf of Kashag paid his tribute to the great souls. He said “George saab was a true friend and supporter of Tibet all the time in his life. He was the first Indian leader to filed PIL in court for Tibetans to protest.” He recalled how much Tibetans love and adore George saab by quoting an example of his hometown where Tibetans used to proudly say that is the field where George Fernandes ’ helicopter landed and he visited them. Kalon Wangchuk said that he is fortunate to born during George saab and Gyari Rinpoche lifetime but feel sad as he didn’t get to work with them. He prayed that they be back as heroes and firmly believed that they will reborn for Tibet. Deputy Speaker Acharya Yeshi Phuntsok, Tibetan Parliament-in-Exile at the memorial event titled “Remembering the life & legacy of George Fernandes and Lodi Gyari Rinpoche – Hero of Freedom, Democracy & Equality”. Acharya Yeshi Phuntsok on behalf of Tibetan Parliament-in-Exile(TPiE) paid his respect and tribute to George Fernandes and Gyari Lodi Rinpoche. 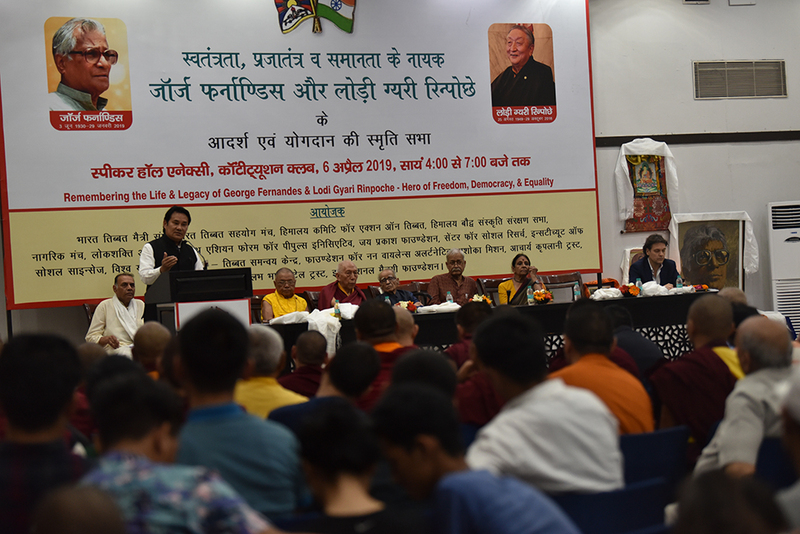 Shri Indresh Kumar echoed “Geoge saab and Gyari Rinpoche were two great souls who had dedicated their life for their respective countries. They were the man with the mission. They will always remain as great as the great man is always a great man.” He paid his respect to the great souls and wishes their friends and supporters to continue their legacy. Mr Matteo Mecacci, President of International Campaign for Tibet (ICT) also paid his tribute to George Fernandes and Lodi Gyari Rinpoche on the occasion. Apart from the above dignitaries, there were many friends and admirers of George saab and Gyari Rinpoche who also offered their respects for the great souls. Earlier, Kasur Ngodup Dongchung, Representative, Bureau of His Holiness the Dalai Lama, New Delhi read out the message of His Holiness the Dalai Lama on the occasion and later handed over the message to Kasur Gyari Dolma, younger sister of Gyari Rinpoche. The event witnessed the attendance of many friends, admirers and supporters of George Fernandes and Gyari Lodi Rinpoche. There were old and young, Indians and Tibetans, monks and school children from Majnu ka Tilla Tibetan Settlement listening to the speakers. They paid homage and tribute to the great souls by offering Tibetan auspicious scarf (khata) to their portraits at the end. Monks from Sakya Centre, Delhi chanted Buddhist prayers for the two great souls. The event was jointly organized by India Tibet Friendship Society(ITFS), Bharat Tibbat Sahyog Manch(BTSM), Himalayan Committee for Action on Tibet (HIMCAT), Himalayan Buddhist Cultural Association(HBCA), Citizen’s Forum, Lok Shakti Abhiyan, Jai Prakash Foundation, South Asian Forum for People’s Initiative, Centre for Social Research, Ashoka Mission, Institute of Social Science, Vishwa Yuvak Kendra, India Tibet Coordination Office, Foundation for Non-Violence Alternative, Sardar Vallabh Bhai Patel Trust, Acharya Kriplani Trust and International Maitreya Foundation. Kasur Ngodup Dongchung, Representative, Bureau of His Holiness the Dalai Lama, New Delhi read out the message of His Holiness the Dalai Lama at the occasion. 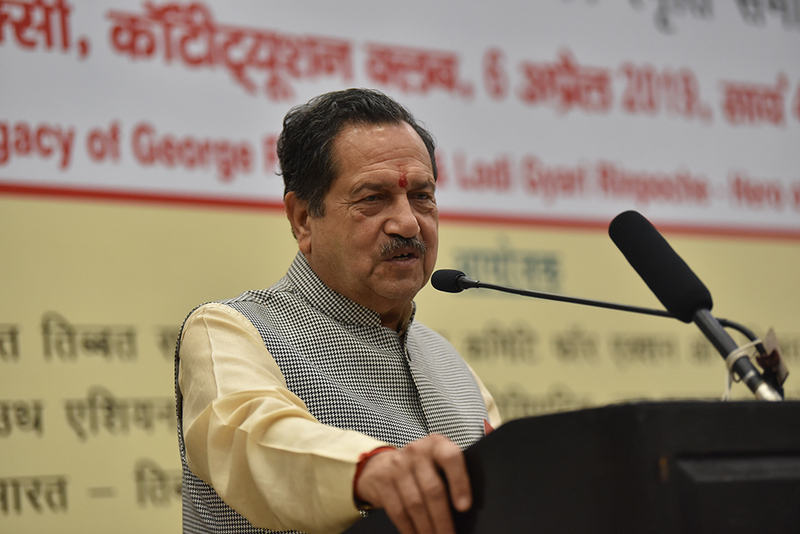 Shri Indresh Kumar, RSS Leader addressing the memorial event in honour of George Fernandes and Lodi Gyari Rinpoche. 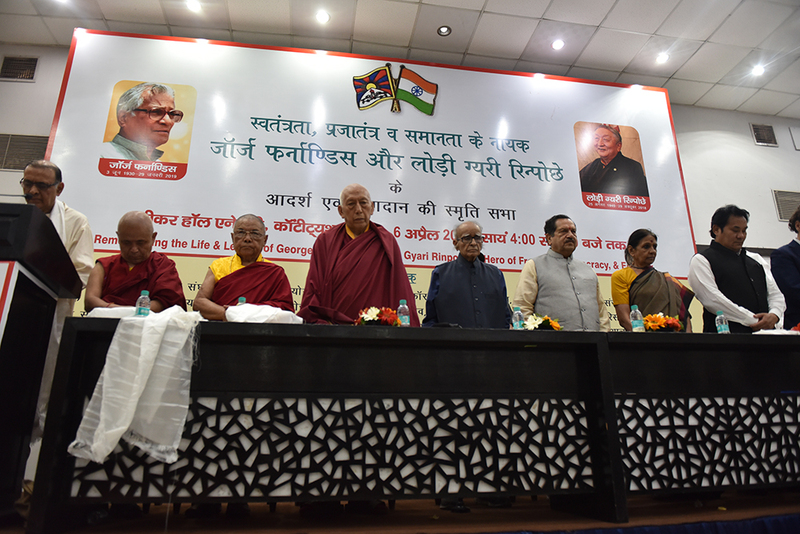 Tibetan and non-Tibetan dignitaries at the memorial event, “Remembering the life & legacy of George Fernandes and Lodi Gyari Rinpoche – Hero of Freedom, Democracy & Equality”.